Advantages: For Multi-Air Plus Soft-Touch discs, Norton SG Premium is blended with heat-treated aluminum oxide grain; latex paper with blue fibers; uncoated water-based coating; no pigment in No-Fil or bond system; flexible and colorful self-closing of the foam; configuration with several holes; color coded discs; faster shear rate; improved productivity; flexible and tear-resistant; improved load resistance; there is no risk of color transfer; allows grinding of the contour without cutting; maximum dust extraction to clean the work surface; easy identification of the product. The MULTI AIR PLUS SOFT is available in the grain range: P220-320-400-500-800-1000. 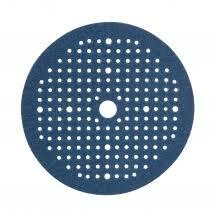 Soft-Touch Multi-Air Plus disks have a soft foam pad with high performance and extremely long life. The foam layer absorbs any surface difference when grinding without cutting the paint layer, maintaining excellent cutting performance at a very high level. The original Soft-Touch system is designed to provide a solution for every application. The foam pad is color coded to help identify the disc needed for each grinding operation.